Methylmonohalides are produced by halogenating methane at a temperature of 100 to 300°C in presence of a supported metal of group 8 as catalyst. This invention relates to solid acidic or metal catalyst-promoted halogenation of methane to produce methyl monohalides in high selectivity. Concurrent or simultaneous hydrolysis provides methyl alcohol and/or dimethyl ether in good yields. The selective conversion of methane into its monofunctional derivatives, such as methyl halides or methyl alcohol, is highly desirable, but in practice has not been achieved on any practical basis. If methyl chloride is the preferred product, a large excess of methane (approx. tenfold) must be used, as methyl chloride is more rapidly chlorinated than methane under free radical conditions. There are normally many by-products of the chlorination of methane, such as hexachloroethane and small amounts of trichloroethylene.
. Methyl alcohol is increasingly important not only as a chemical raw material and building block for such products as formaldehyde, acetic acid, vinyl acetate, ethylene glycol and others, but also via its condensation reactions to give gasoline or hydrocarbons, such as olefins, aromatics and the like. Its direct use as a transportation-fuel is also gaining importance. A whole scope of so-called C1 chemistry is based primarily on methyl alcohol. Methyl alcohol, once produced from wood fermentation (i.e., wood alcohol), is, at the present time, nearly exclusively produced from CO and H2 (synthesis gas) derived from coal or natural gas. Coal or methane first must be converted in an energy consuming step into syn-gas, which is then, in a second energy consuming step under pressure and generally forcing conditions, converted into methyl alcohol. Clearly, direct oxidative conversion of methane into methyl alcohol would be highly desirable. Despite continued efforts no such process was, however, previously achieved on a practical scale. The oxidation of methane generally is not selective. 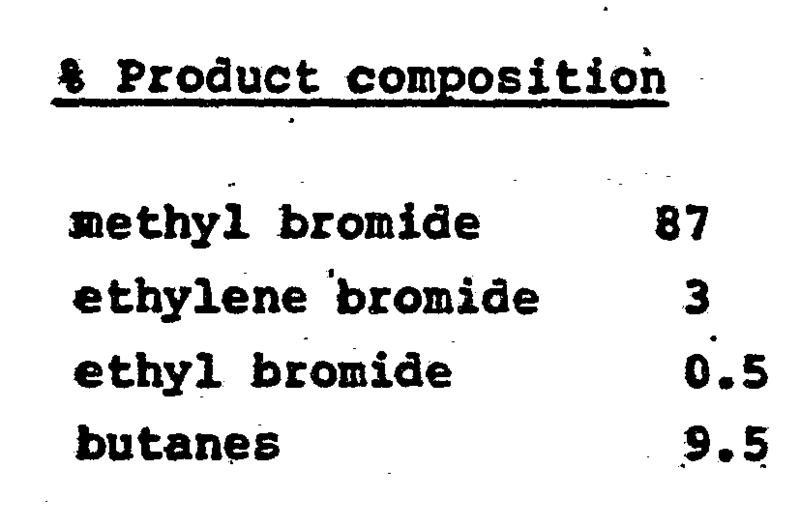 In the past, many attempted oxidations concentrated on manufacturing formaldehyde from methane. The low rate of reaction of CH4 at temperatures below 600°C coupled with the high rate of decomposition of formaldehyde above 600°C is probably the reason that no industrial process has been developed to date. Decomposition of formaldehyde could only be avoided be extremely short residence times. Such a process has been recently described involving partial oxidation of methane to methyl alcohol and formaldehyde. The residence time is 1.55 x 10-3 sec. and the pressure 60 atm., respectively (Huels). However, oxidation of methane, similarly to chlorination, is free radical chain reaction, which explains the observed lack of selectivity. I have previously described in the Journal of the American Chemical Society, Vol. 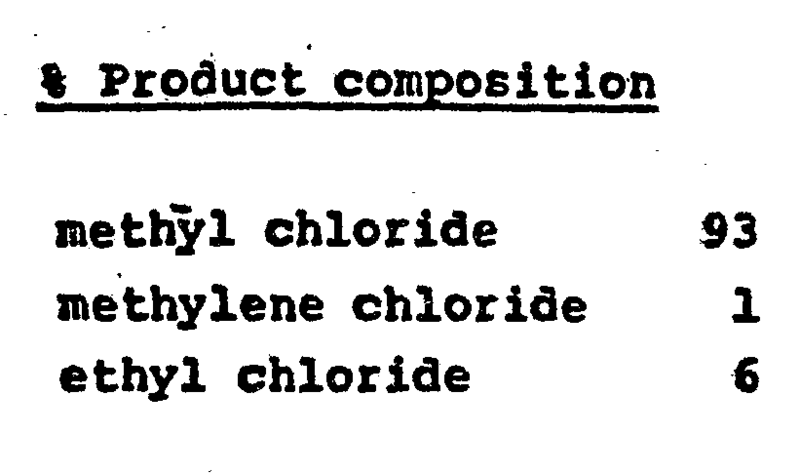 95, 7686 (1973) that, under specific conditions, alkanes can undergo electophilic chlorination and chlorinolysis. With a SbF5 catalyst in SO2CIF solution at -78° or at room temperature with a reaction time of 24 hours, methane was transformed qualitatively to methyl chloride. No practical yields were obtained. AlCl3 catalyst gave under similar conditions 1% methyl chloride. These reactions clearly did not represent a practical method for the chlorination of methane. The present invention relates to a process for the selective halogenation of methane to produce methyl halides and through their hydrolysis methyl alcohol and/or dimethyl ether. Either (i) solid strongly acidic catalysts, including strong Bronsted or conjugated Lewis-Bronsted supesacid catalysts, or (ii) supported Group VIII metal (particularly platinum and palladium) catalysts are capable of catalyzing the gas-phase halogenation of methane predominantly to methyl monohalides in 85 to 99% selectivity. Subsequent or concurrent catalytic hydrolysis gives methyl alcohol and/or dimethyl ether. A particularly useful class of solid, strongly acidic catalysts are those derived from halides, oxyhalides, oxides, sulfides and oxysulfides of metals, particularly transition metals of Groups IV, V, VI, VIII of the Periodic Table, such as of tantalum, niobium, zirconium, tungsten, titanium, chromium and the like, or mixtures thereof, deposited on suitable chalcide carriers, such as alumina, zirconia or silica-alumina. These catalysts are capable of effecting the ready conversion of methane to methyl halides. As noted in Olah, G.A. "Friedel-Crafts Chemistry," N.Y., Wiley-Interscience, 1973. p. 343-344, the elements of Group VIA such as oxygen, sulfur, selenium or tellurium, have been called "chalcogens", and compounds containing these elements are called "chalconites", "chalcogenides" or "chalcides." A variety of solid oxides and sulfides, especially those-comprising alumina, silica and mixtures of alumina and silica, either natural or synthetic, in which other oxides such as chromia, magnesia, molybdena, thoria, tungstic oxide, zirconia, etc., may also be present, as well as sulfides of molybdenum are useful chalcide carriers. Many naturally occurring compositions exist for use as the carriers including: bauxite, floridin, Georgia clay, and other natural aluminosilicates. Synthetic chalcides, other than those of the silica-alumina type, representative of the chalcide carriers are: BeD, Cr2O3, P2O5, ThO2, TiO2, Al2(SO4)3 (which may be regarded as Al2O3·3SO3), Al2O3·Cr2O3, Al2O3, Fe2O3, Al2O3·Coo, Al2O3·MnO, Al2O3·V2O3, Al2O3·Mo2O3, Cr2O3·Fe2O3, MOS2, and MoS3. The acidic chalcide supports are physically and chemically stable. They are generally catalytically active at only higher temperatures, as their acidity is not great enough to lead them to form stable complexes with unsaturated compounds, as do the aluminum halides, for example. Another class of useful solid strongly acidic catalysts are the strong Bronsted or conjugated Lewis-Bronsted superacid catalysts. These catalysts include Bronsted-type perfluorinated sulfonic acids of 4 to 18 carbon atoms deposited on a suitable inert carrier or polymeric resin-sulfonic acid catalysts. These solid superacid catalysts have a Hammett acidity function (HO) of less than -11.9, the value for 100 percent sulfuric acid. The supported Group VIII metal catalysts include the various Group VIII metals supported on suitable chalcide carriers. Particularly useful are platinum and palladium supported on alumina, silica, active carbon, barium sulfate or related carriers. It is my invention that a practical process has been found for the selective acidic or metal catalyzed halogenation of methane to methyl monohalides (chloride, bromide, iodide or fluoride). The acidic halogenations are carried out over solid acidic catalysts, particularly supported metal-based catalysts, preferably selected from transition metal halides, oxides or oxyhalides, such as those of iron, tantalum, niobium or zirconium, on alumina, baria, or other neutral oxides, barium sulfate or related carriers, or over solid Bronsted-type perfluorinated sulfonic acids of 4 to 18 carbon atoms deposited on a suitable inert carrier or polymeric resinsulfonic acid catalysts at temperatures between about 100 to 500°C, preferably between 200 and 325°C. Metal catalyzed reactions are carried out over supported metal catalysts, preferably of the Group VIII metals, on alumina, baria, or other neutral oxides, barium sulfate or related carriers, at temperatures between 100 and 350°C, preferably between 200-300°C. The solid acidic reactions are considered to take place via surface catalytic activation of chlorine, bromine, or iodine to an electrophilic halogen species. The selective nature of the reactions is reflected by the fact that even when using an excess of halogen (methane to chlorine ratio of 1:2 to as high as 1:8), methyl halides are formed in 85 to>99% selectivity over methylene halides. At the same time, highly selective (99%) monochlorination is readily achieved when reacting excess methane (methane to chlorine ratio from 1:1 to 8:1) over the same catalysts. Excess methane under these conditions is also a diluent for the system and eliminates any potentially explosive mixtures. It is a further part of my invention that similar selective monohalogenation of methane was also discovered to be possible using supported metal catalysts on alumina, baria, or other neutral oxides, barium sulfate or related carriers. In these reactions, an intermediate insertion of the metal in a C-H bond is premised with subsequent chlorinolysis. In a similar fashion bromination and iodination of methane can also be achieved both in acid catalyzed electrophilic and metal promoted halogenations. Fluorination of methane is also possible, but necessitates high dilution, preferably with an inert gas, and handling difficulties associated with the use of elemental fluorine. When the halogenation of methane is carried out in a fashion that the halogenation step is directly followed, without separation of products, by passing the mixture together with anhydrous hydrogen fluoride, over a catalyst such as fluoridated alumina or higher valency metal fluorides, such as cobalt trifluoride, antimony perfluoride, or the like transition metal fluorides, methyl fluoride is formed directly from methane without the use of elemental fluorine. Hydrogen chloride, bromide and iodide by-products of the reactions can be readily recycled via oxyhalogenation and thus reused. 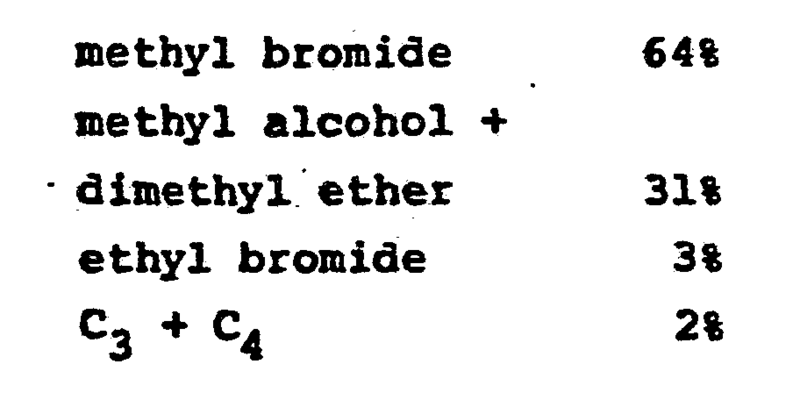 The methyl halides readily obtainable in high yield and selectivity according to my invention are also conveniently used via their hydrolysis either under thermal or catalytic conditions, to produce methyl alcohol and/or dimethyl ether. The conversion of methane to methyl alcohol can be accordingly carried out as a two-step process, but also can be practiced as a single-step process converting methane directly to methyl alcohol (and/or dimethyl ether) when reacting methane in the presence of water (steam) with halogens. In this application, acidic oxides, oxyhalides or Bronsted acidic catalysts, compatible with water, are preferred. As hydrogen halides (X = Cl, Br, I) can be readily recycled via oxyhalogenation, the disclosed process represents a viable and energy saving alternative to the production of methyl alcohol from CO and H2, i.e., syn-gas. In all of the reactions discussed, the catalyst is preferably present in an amount of 0.1 to 25% based on the amount of methane. The following examples are illustrative and are set forth for the.purpose of illustration only and are not to be construed as limiting the scope of the invention in any manner. In the related Tables, the product compositions have been normalized, even if not stated, to provide 100 percent conversion, excluding unreacted methane which can be recycled. A 1:1:1 molar mixture of methane, chlorine and water was reacted over a 20% tungsten oxide on alumina catalyst at 250°C. With a 49% conversion, the following product distribution was obtained. A 1:5 molar mixture of methyl chloride and steam was passed, in a continuous flow reactor, over a catalyst composed of 10% zinc oxide on alumina containing 10% aluminum hydroxide at 385 C. A 29% conversion per pass of methyl alcohol was obtained with 98% selectivity. Under conditions of Example 12, when carrying out the reaction with a catalyst composed of 10% magnesium oxide on alumina containing 10% aluminum hydroxide at 420°C, a 21% conversion to methyl alcohol was obtained with 98% selectivity. Under conditions of Example 12, when carrying out the reaction with a catalyst composed of 10% titanium oxide on alumina containing 10% aluminum hydroxide, a 18% conversion to methyl alcohol was obtained with 98% selectivity. 1. A process for the selective catalytic production of methyl monohalides from methane carried out at temperatures between about 100 to 300°C in the presence of a halogen using as the catalyst a supported Group VIII metal catalyst. 2. The process of claim 1 utilizing a Group VIII metal supported on alumina, silica, active carbon, barium sulfate or other carriers. 3. The process of claim 1 or 2 wherein the catalyst is present in amounts of 0.1 to 25% by weight based on the amount of methane feed. 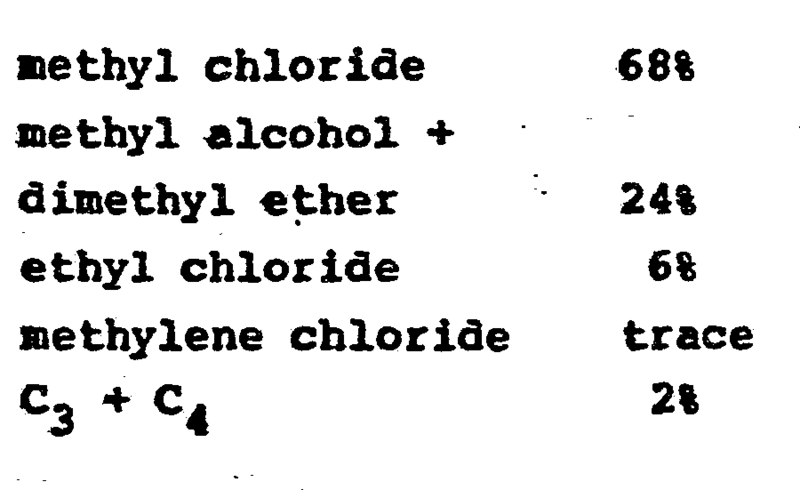 US1086381A (en) * 1912-10-11 1914-02-10 Du Pont Powder Co Preparation of alcohol from chlorhydrocarbons.